Indianapolis, IN: A press conference was held early this morning for the presentation of the award for the Most Beautiful Daylily in the World at May Dreams Gardens. Members of the media were asked to arrive early to ensure that the bloom would be at its peak for photographs. Fortunately, the plant was at the edge of Plopper's Field, where plants are just plopped in willy-nilly where there is room, so it was easy to photograph. After an appropriate amount of exclamation over the beauty of this daylily, members of the media were allowed to take pictures and ask questions. One of the most asked, and unanswered, questions was about the name of the daylily. The owner of the garden, who was not present, did not know. However, her garden secretary, Miss Jane Hortaway, indicated that the owner would return to the place where she bought the daylily, Soules Garden, as soon as possible to determine the name of this, the most beautiful daylily in the world. The owner's garden stylist, Gloriosa Vanderhort, was also on hand to elaborate on the award and the qualifications for it. 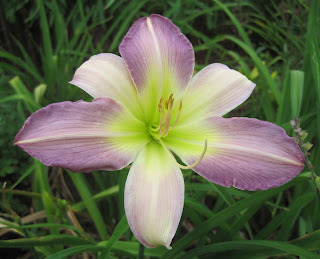 She said that what qualified this daylily to be the most beautiful daylily in the world was the green center, the pastel shadings of the petals, and the very slight ruffle-i-ness. When asked what the owner planned to do with this daylily, Miss Jane Hortway replied, "I'm sure Carol will mark this plant and then later, rain permitting, she will likely dig it up and divide it to spread about Plopper's Field and perhaps share with others. Carol believes that beauty of this sort must always be shared." *Update - I've heard back from my friends at Soules Garden. The Most Beautiful Daylily in the World is 'Moonlight Orchid'. They say it is almost always sold out. Do you think it deserves most beautiful in the world designation , Dee? I love lavender and purple daylilies. This one is really lovely. Does Miss Day Lily get a crown and a sash like other beauty queens? I certainly hope so! I haven't seen any lavender daylilies so I agree that this is quite beautiful. I've never seen a daylily of that color --it is gorgeous! Sandy and Helen, I don't think it is 'Lavender Heartthrob'. The petals are longer than the picture of that one. I am hoping to get over to the daylily place next week to find out what it is. Whatever the name, it is a winner. Now that we know the name, can look for it. Moonlight Orchid, lovely name. It is a beautiful daylily and what I love about gardeners is their great generosity - always sharing beauty.